Do you like running in the rain? I have to admit that while it’s not something that I do willingly, it does make running a lot more memorable! Since it’s Friday, I’m linking up with Courtney, Mar, and Cynthia for the Friday 5! The theme this week is fitness, so let’s talk a little about running a race in the rain! On May 1, I ran the Broad Street Run, the largest 10-mile race in the country. And if you missed my race recap, it was raining before, during, and after the race, nonstop! PS – check my race photos here, my bib # is 30083! 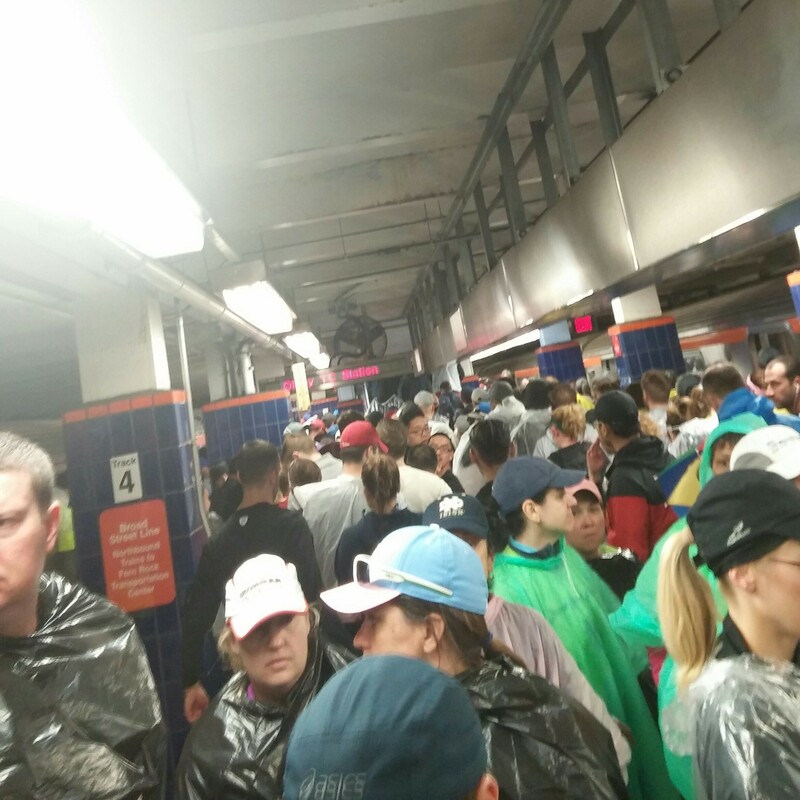 Being my first time running such a long distance in the rain, I was extremely anxious about how the rain would affect my running, and I wanted to ensure that I was as comfortable as possible…at least as much as you can when running with 40,000 other people! 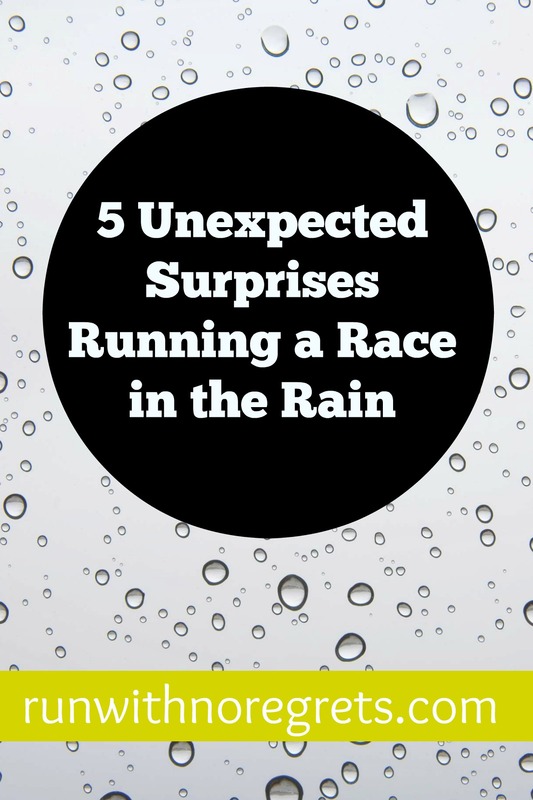 As you would probably expect, I learned a lot about running a race in the rain, and I wanted to share some of those unexpected surprises! Running in the rain puts your body through a lot of different changes, especially from feeling cold to warm to cold again. It really took me by surprise! While I was waiting in line at the Broad Street Run, I wore a kitchen garbage bag to stay warm and dry, which surprisingly worked really well! Pro Tip: I recommend NOT cutting out holes for your arms! But once I headed to the starting line, I was completely exposed to the elements and I have to say that it felt really refreshing to be running in the rain…at first! It didn’t take long to realize that my hands were freezing! Cold and wet, always a great combination, right? I almost wished that I brought gloves! But after a couple more miles, my body started to warm up and I felt “normal” despite the circumstances. This was when I was finally feeling like myself. Then maybe around mile 7, I started to feel pretty miserable and ready to be done with everything! Again, it never stopped raining! Crossing the finish line, I felt really warm but made sure to grab a heat sheet because I knew as I cooled down from the rain, I would really cold! What I now realize that instead of searching for Bret, I should have immediately went to the gear check and found my change of clothes. I was really shocked around 6 miles in when my headphones kept slipping out of my ears. They aren’t the fanciest headphones to begin with and sometimes I have to adjust them when I’m on a dry run, but this was ridiculous. I can’t help but wonder if I wasted any time trying to awkwardly adjust and readjust my headphones (my left ear caused the most trouble) while running. If it gets to be a real pain, it might be just worth it to remove your headphones for the remaining of your race. Another alternative is to invest in wireless Bluetooth headphones. I have become a huge fan of the Aftershokz brand and have used them during many training runs and races, including during the rain, with no issues with slipping! Check out my reviews of the Trekz Titanium and the Trekz Air to learn more. They are absolutely worth the investment. Okay, so you can probably imagine that running a race in the rain, especially a road race, will have some hazards, like puddles. But it really was more chaotic than I expected. The Broad Street Run is a huge race, so you’re constantly surrounded by people. Add in a little rain and things can get very interesting. You have to be even more careful going past people and watching out for people around you who could slip or trip on the road. At one point on South Broad, we were running on the right side of the road and there was a huge flood of water that I had to quickly scurry away from. Then you have the road itself that’s slippery from the painted crosswalks and road lines. And don’t even think about running on the median to avoid the crowds. Not in this weather. I made sure to always run on the actual road. And don’t forget all of the wet, discarded clothing left behind from runners. Ponchos and garbage bags are extremely dangerous when left on the road, so you really have to watch your step. It’s nice to get in the zone on the run, but when you’re running a race in the rain, paying attention to your surroundings is more important than ever! Compression socks can be a gift and a curse. Wearing Body Glide on my feet with compression socks seemed to work really well on the course. I had no issues with my feet sliding in my shoe and while my feet certainly were not dry, I wasn’t squishing along for 10 miles, thank goodness! But the worst thing for me was trying to take them off when the race was over! My socks were stuck on extremely tight, probably due to the natural swelling of my feet in addition to the rain. Maybe next time, I should just stick to more traditional, non-cotton running socks? Also, after the race, it’s important to dry your shoes and insoles! I heard everyone talking about stuffing their shoes with newspapers, but who has those anymore? Luckily, I actually had some old running shoe boxes at home and used the paper inside to stuff both of my pairs of sneakers. I was pleased to see that it did the trick! 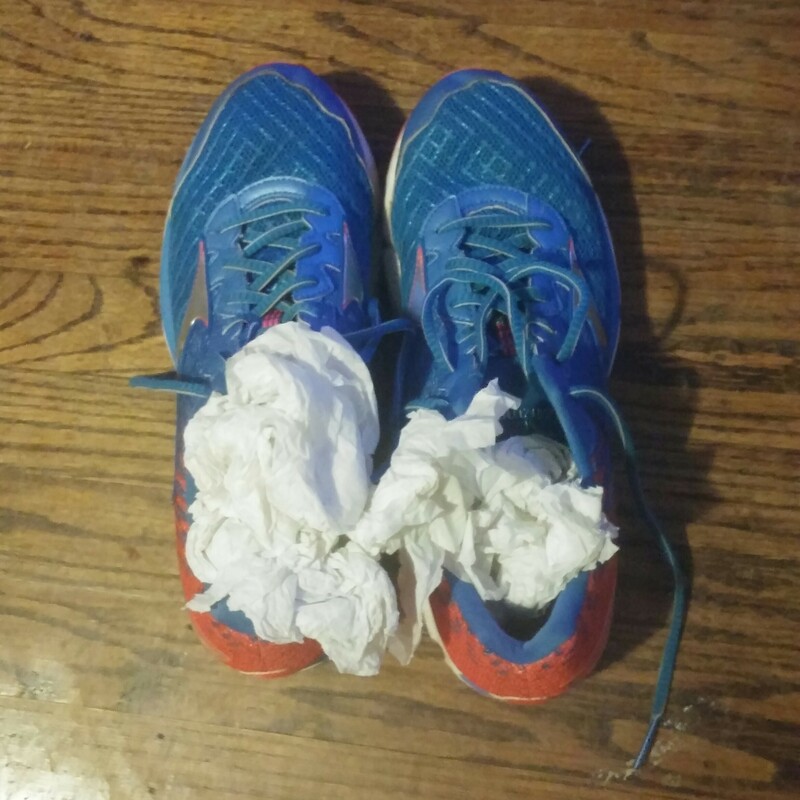 Stuffing your shoes with paper really works! To be honest, I am a little bit disappointed about the rain from Broad Street because there were fewer people out cheering us on the course. That’s a big part of the Broad Street Run experience. But the pleasant surprise about that was that when there was a crowd, they were even more special, at least to me! Everyone who was out cheering on friends, loved ones, and even strangers, were absolutely amazing. I loved the energy that brought, even in fewer numbers. All of the funny signs (including a few about chafing) really cheered me up. And who doesn’t love getting high-fives from little kids? And don’t forget the volunteers – they’re out there just like we are as runners, working hard and facing the elements just the same, if not even longer. I hope they got a lot of thank you’s because they were all awesome! Thursday 4/28: Core and more class for the first time in a few weeks. I was the only one in class so I got my own private lesson! We spent a lot of time on the floor and I have to admit that I really struggled with the leg raises. My lower back, upper abs and obliques were crying for a couple of days! Friday 4/29: I was feeling extremely lazy but I decided to go through with running on the treadmill at the gym at work. I ran for about 3 miles in my new New Balance 1080 Fresh Foams. I’m still breaking them in, but I kept the run at an easy 11:06 pace. Saturday 4/30: Rest before the big race! Sunday 5/1: The Broad Street 10 Mile Run! Monday 5/2: I went to yoga class which was awesome. We worked our way to wheel and it was the strongest one I’ve ever done (woohoo!). After work, I had boot camp class and it was pretty intense thanks to all the plank workouts! Tuesday 5/3: I was supposed to have softball, but the game was canceled due to rain. Wednesday 5/4: Since I was working late (again), I only had time for 15 minutes of weight training class. I did do lots of heavy lifting, though! Thursday 5/5: Cinco De Mayo! I went to Core and More class and had another great workout with Delilah. We used light weights for some of our exercises and did lots of twisting moves and floor exercises. My abs were crying again! Do you like running in the rain? Have any funny stories to share when running a race in the rain?